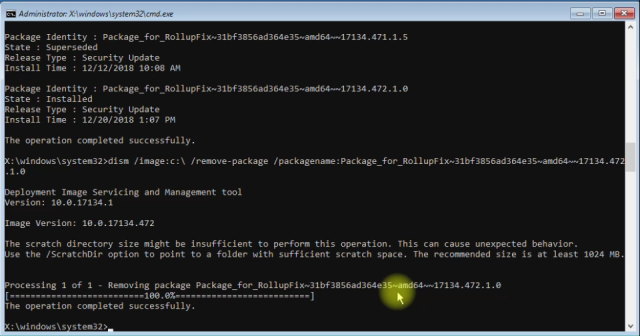 This video guide covers how to remove Window’s Updates in the builtin Recovery Environment, found in Windows 8, 8.1, & 10, using the Command Prompt and DISM commands. Commands and directions are also located below the video. Hold Shift key while choosing Restart from Start Menu or Ctrl+Alt+Del menu. If you are stuck in a boot loop after updates you should get to the recovery environment after 3 interrupted updates. If the boot loop occurs after the dots have finished spinning you may have to manually interrupt the start up process. As soon as you see the dots start spinning just hold your power button until the device powers off. Start up again and as soon as the dots start spinning hold the power button again. After interrupting three times in a row you should get the option for ‘Advanced Options’ which will take you to the built in ‘Recovery Environment’. From there choose ‘Troubleshoot’ > ‘Advanced Options’ > ‘Command Prompt’. If you have any issues or questions just comment below!